Productivity Boot Camp is now LIVE! Head to ProductivityBootCamp.com to find out more and order! Now, let me back up and tell you what the heck PBC is, what's included, how it works, and why you proooooooobably need it in your life. Aside from budgeting and frugal living questions, one of the most common questions I get asked is, “How do you do IT ALL”. For years I brushed the question aside because, PUH-LEASE, no one can do “it all”. I mean sure, I have lots of kids, several businesses, and lots on my plate that I enjoy and keep up with for the most part. But I don't do “it all”. No one does. And yet, the questions continued to flood in, on the daily. I may not do “it all“, and I certainly don't do it perfectly all the time. But I have learned how to do everything I NEED to do more efficiently, so I have time to do what I WANT to do, more frequently. As I started sharing my simple (to me) tips casually on social media, the response was astounding. I couldn't believe how many Freebs were not only finding hope and encouragement in my words and tips, but finding major success in using them. Then, after teaching several classes at various conferences (about productivity and working smarter, not harder) that all resulted in standing-room only and incredibly positive feedback, I knew I had hit on a hot-button issue that needed addressing. …And Productivity Boot Camp was born. 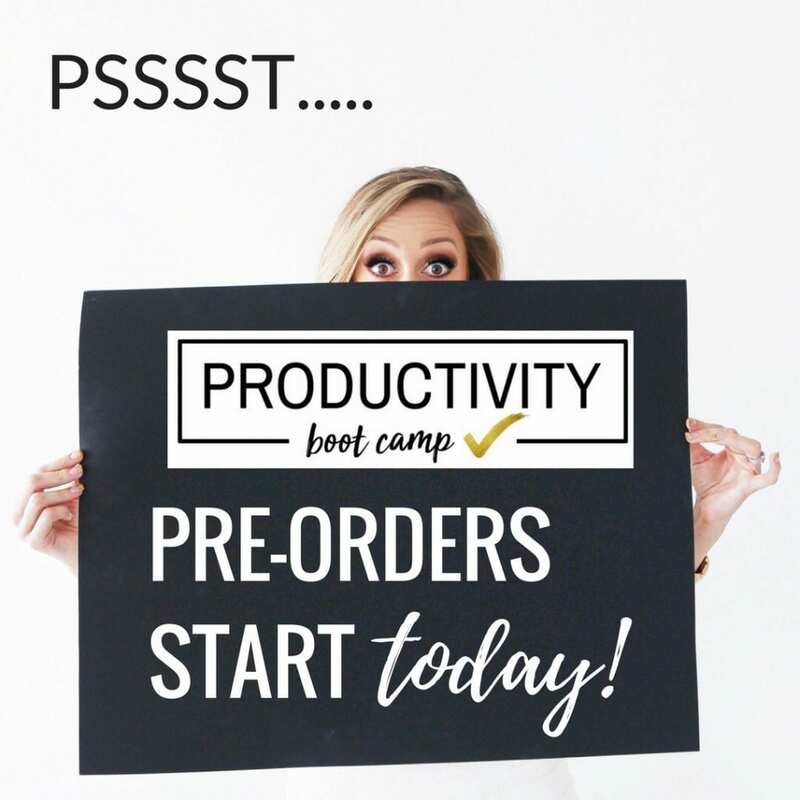 Head over to ProductivityBootCamp.com and order today! And since we are all oohing and aaahing over that cute Productivity Planner above, let's talk about it for a sec! 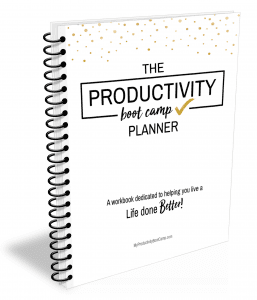 This 30+ page Productivity Planner workbook is a MAJOR perk to this program. This is what makes the difference between me just telling you a bunch of stuff, and me actually doing it with you; holding your hand and walking you through, step by step, inch by inch, through overhauling your time, productivity, and general quality of life. The planner comes in PDF form. You can print it out in color and bind it all pretty like I did above, or you can print it in plain ol' black & white. Whatever floats your boat. Will we ever have an actual planner that gets shipped to you at some point? Oh boy I hope so! I'd love to have an actual Productivity Planner someday, just like the cute planners you see in Michaels or Staples. Being honest with you, that will still take quite a while to figure out (and format so you have enough room to write! And how to make it so it doesn't cost you a million dollars!). So for now, this awesome PDF version is the best option for many reasons, so use it, abuse it, and enjoy the heck out of it! It's designed to be a 6-week program, and is designed to do again and again. The first time you go through you should do it exactly as outlined, with the pace as outlined, in order to get the best results. Then, once you graduate into the world of “Reformed Hot Mess”, you can revisit the program as many times as you'd like, jumping around to the areas that you need to refresh and review, and doing it at your own pace. Each time you go through the program you will focus on tackling different “pain points” in your life; areas that really aren't very productive nor fulfilling, and tackle them, master them, and refine them until they are no longer pain points. You have unlimited access to the program for an entire year (which means you could go through the program 8.5 times at least! You'd basically have it memorized by then!). Once your year is up you can choose to renew for just $10, which gives you an entire new year of access. Why do we do this? Easy. To make it work better for YOU. We have found an increasing trend where Freebs spend good money on my program, but then never complete it, or maybe never even start it at all. When it comes to productivity, it's all about PACE. We are putting a deadline in for you, to (lovingly!) force you, in a way, to keep pushing forward so it's not a waste of your time or money. They program simply won't work (not well, at least) if you lose steam halfway through, or you watch a few videos here or there. This will *hopefully* help you push through and get the job done and still have plenty of time to do it again and again! If you have a pulse and aren't a robot…yes. Yes, it will. One of the things I'm most excited about with PBC is that it's 100% customized for YOU. Sure, I give examples from my own life of being a married mom with kids. 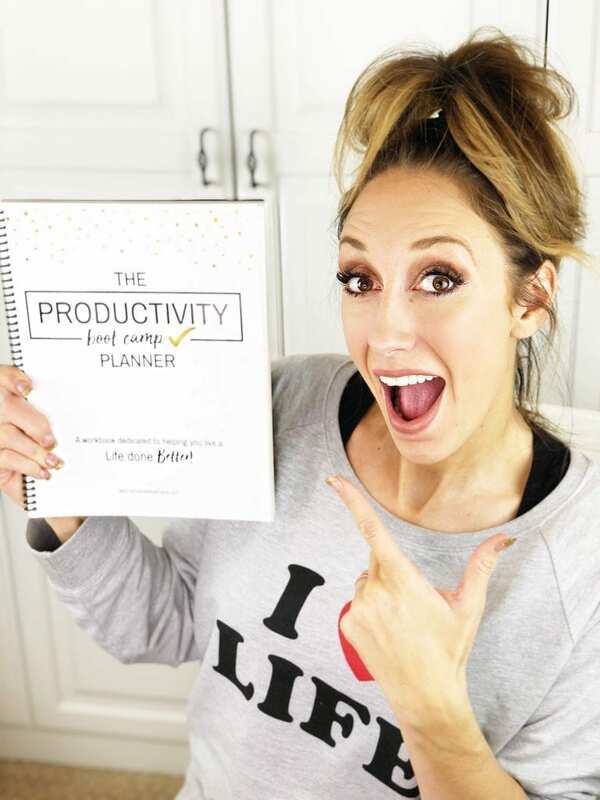 But every inch of the program is designed for YOU to choose what productivity means to you, what pain points YOU want to tackle, how YOU want to spend your time, what areas YOU need help with…you get the idea. Think of it as the ultimate “choose your own adventure” program. So, yes. Whether you are single, married, a student, an empty nester, a SAHM, working full-time, whatever it is, yes. This can work for you. If not? I'll refund your money. Keep reading for that, too. WHAT ABOUT BUDGET BOOT CAMP? BBC is the big brother and is still doing great! For those who already have BBC, some have asked if there's an discount for this PBC pre-order. Unfortunately, there is not, because the pricing is already SO LOW compared to the list price. We will have bundling options for those who want both programs, but not until May when PBC actually launches. We haven't decided the pricing yet exactly, we are still working out some kinks. So I hate to pass the buck, but it's totally up to you as to whether you want to wait or not. However…I will reiterate that this PBC pricing will never be this low again, so if it were me, I would snag it now. But hey, maybe I'm just biased! Yes! Digital products are tricky, and most people have an “all sales final” policy. However, Mama J wouldn't do that to you. It's not worth it for me to keep your money, but have a bunch of unhappy Freebs egging my house because I was a scrooge about it. So yes, if you are unhappy with this program for whatever reason, and feel that it did not boost your productivity or organization in any way, then we will certainly refund your money within 60 days of purchasing the program. The exception is anyone who pre-orders, your 60 days will start as soon as you get access to the actual program. NOW, WHAT ARE YOU WAITING FOR?? GO AHEAD AND ORDER NOW! Be sure to check out Productivity Boot Camp and FunCheapOrFree on Instagram for all the latest news and updates! I am really looking forward to this program, it sounds like it is just what I need. I signed up for the new program this morning (I hope), but just wanted to know if I should expect some sort of response email??? I know you are probably over-run with subscribers but just wanted to check as the page I was on was very simple and worry that I missed something. Sorry if this is a nuisance question, I just don’t want to miss out!!! Hey Lesley! Can you email me Alisha@FunCheapOrFree.com, and I will look into it. Can we buy just the planner? The planner isn’t for sale outside of the program. It is designed to go hand in hand with PBC, it wouldn’t make sense otherwise. Can you tell me how different is this program from your Tuesday night programs or YouTube online? I haven’t really shared much of what is in the program. 98% of the content is brand new, never heard before. You should look into self publishing the planner. Lulu.com is a great option I love and you won’t have to have inventory as it prints on demand. Personally I think a hard paper copy for signing up makes sense. Hi Jordan, Can this be purchased in England. Hi! When will the actual program start? I have signed up but cant find when we can expect to start? Thanks! Thanks for signing up! We are hoping for sometime in May! Keep an eye on Instagram and your emails! I got rid of my instagram and Facebook. I use my email all the time. Are you still planning to release in May sometime?!?! I’m starting my first honest to goodness big girl job (at 40 lol) and we just moved into this house and my husband is on the road. And I’m honestly just trying to reel in my lightening fast mind to focus on one thing at a time and I’m going a little buggy!!!! Obviously what I’ve been doing hasn’t worked and I’m at a stalemate/24.7 brain fart!!! I’m hoping what you’ve been working on will help me find my ahah moment…. Yes, we just released it! Head to ProductivityBootCamp.com to find out more and order! I tried buying this (3 times)…and am not sure any of the transactions went through. (I just want to buy 1) I didn’t get any confirmation email…and I was taken back to the payment page after I submitted all my info to purchase (using a credit card). Aaahhh…. why did I wait until the last minute?! Hi Jordan!!! I am a huge fan and have been so excited for this program to drop! I am absolutely so ready to take this journey and be among the first to try it! I watch you religiously on instagram and follow your Tuesdays Q&As. I can’t wait to get started! Hi. I purchased the program on April 16 and have not received verification of my purchase. I purchased by PayPal. Who do I contact to verify my purchase at the $99 Pre-Order price? Thank you. Hmm go ahead and email alisha@funcheaporfree.com and she’ll make sure you’re taken care of. The link does not work to get the notification of when the program will be available. Unfortunately I missed the pre-order but definitely want to purchase the program. How can I get notified when it is available again ?? Get on our email list and we will send out a email to give you a notice! You can enter your email in the box on the upper right of my site! Just email alisha@funcheaporfree.com if you aren’t sure and she’ll take care of you! I would like to be notified whenthe next round of sales start for the Productivity Bootcamp. I am graduating next week college program next week and it’s time toget nt personal life abces family back on track! I am trying to purchase the Productivity Boot Camp course and I don’t see where to click that it will link me correctly. Can I still buy it? I work PRN but am mainly a SAHM who homeschools. Most weeks I work 0-2 days outside the home. Occasionally however a co-worker will go out for 6-8 weeks for a surgery, or I will cover a week vacation, cover between employee turnover etc., and I work full time for that duration. Is the program changeable by month or week or do you set it for one “mode” in the beginning? Thanks. Thank you for your message. You can go to https://funcheaporfree.com/bootcamps to order! Good luck!